I am working on a new quilt. 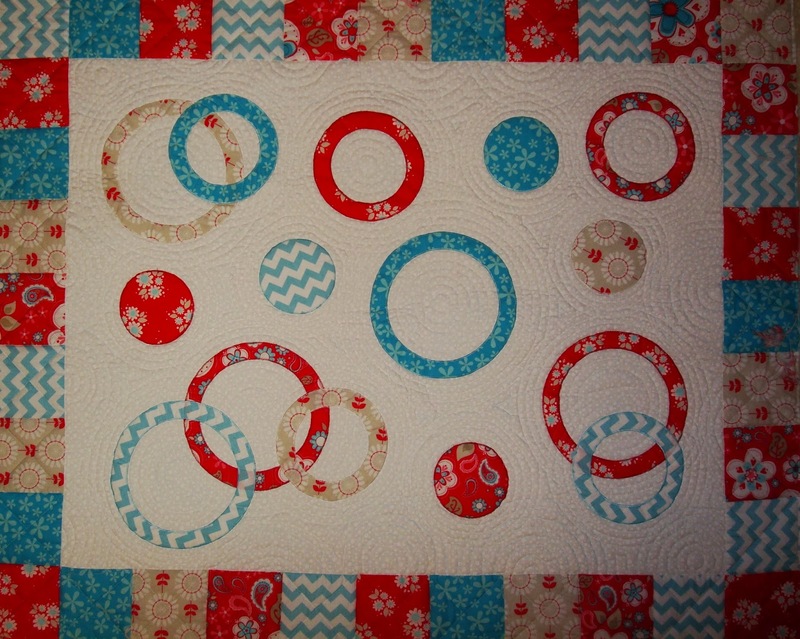 The fabrics are Jinny Beyer's collections from RJR Fabrics. I made many triangle units from all the different colors. I placed these units in rows and sewed them into strips. Now I am ready to sew the strips togehter. Patchwork Plus for a floor model. 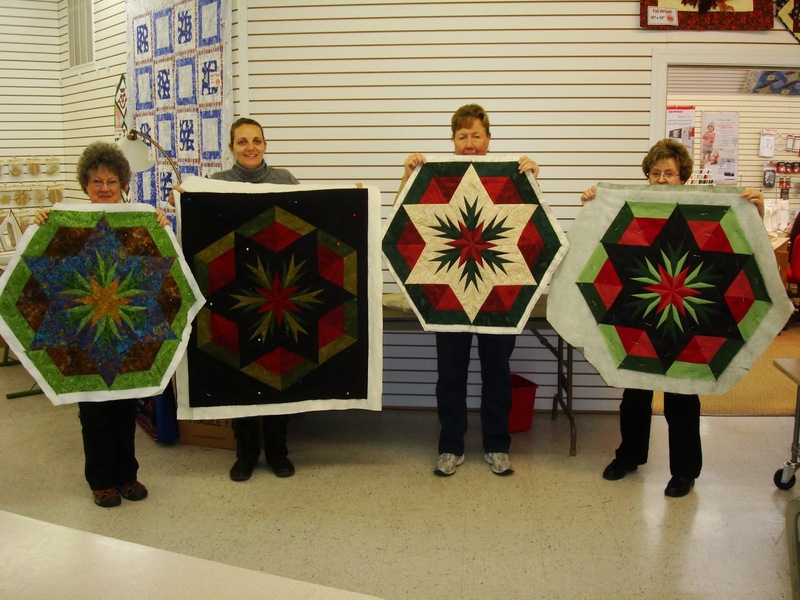 This is my Desert Rose class at Patchwork Plus. It is always fun to see the different color combinations students pick. shaped the bowl as I sewed. Here is a tutorial at Clothesline fabric bowl tutorial.
. It always impresses me how spunky Mom is on this excursion. 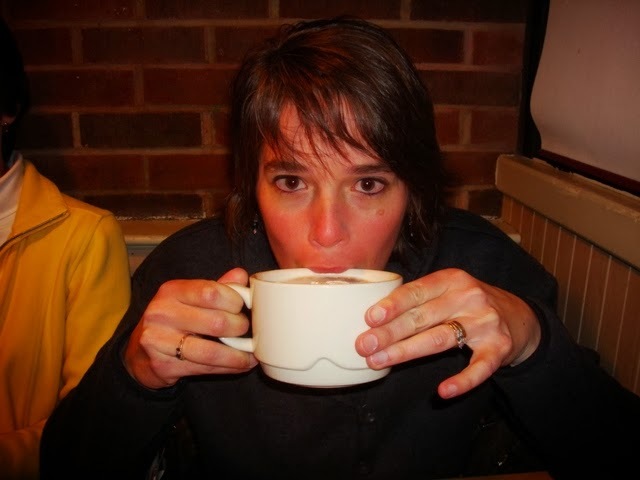 Sandra enjoying a warm cup of hot chocolate. 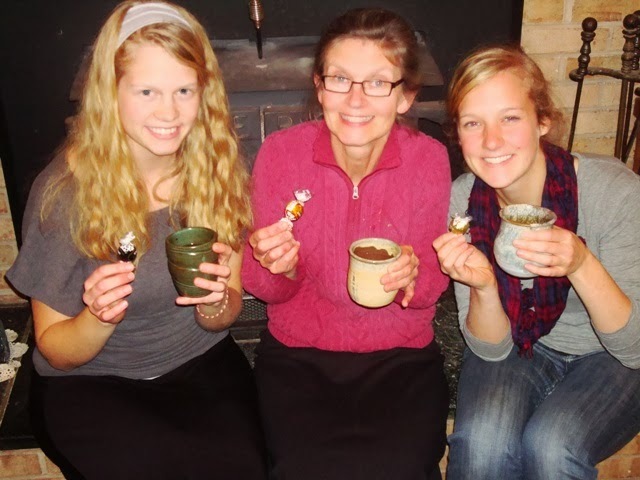 I love setting around the fire with my family and drinking coffee. Sometimes we treat ourselves to chocolate. 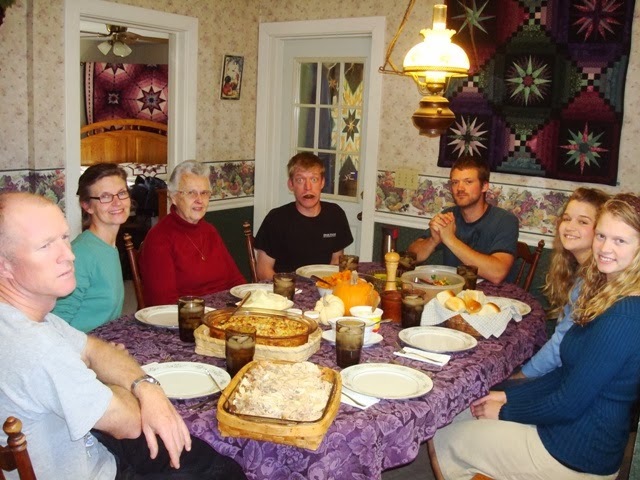 This year my birthday was on Thanksgiving which was great because my family spent the day at home. Another plus was Rebecca made most of the meal, I was just her gofer. She did the turkey and the works. Parla we missed your family. 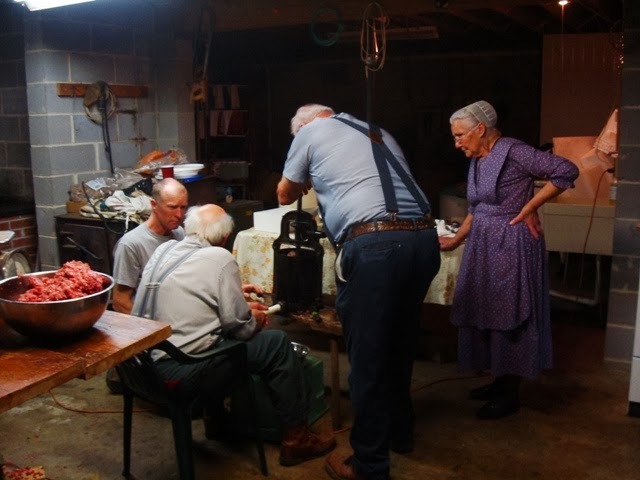 Butcher Day at Uncle Joes. 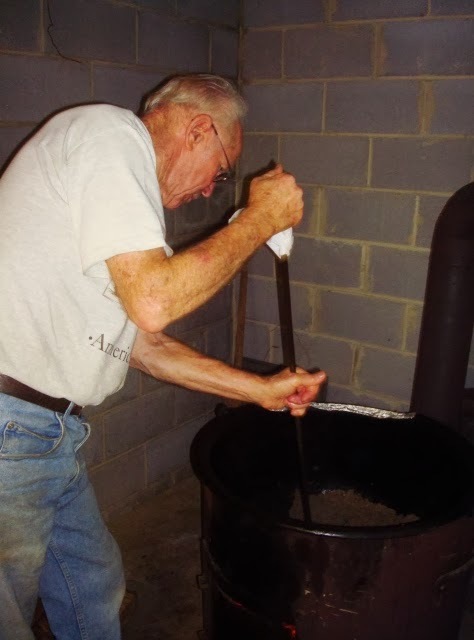 Dad stirring the pudding meat. It is a big day but so nice to go to the freezer and pull out some meat or grab some canned sausage or cubed pork off the canning shelves. 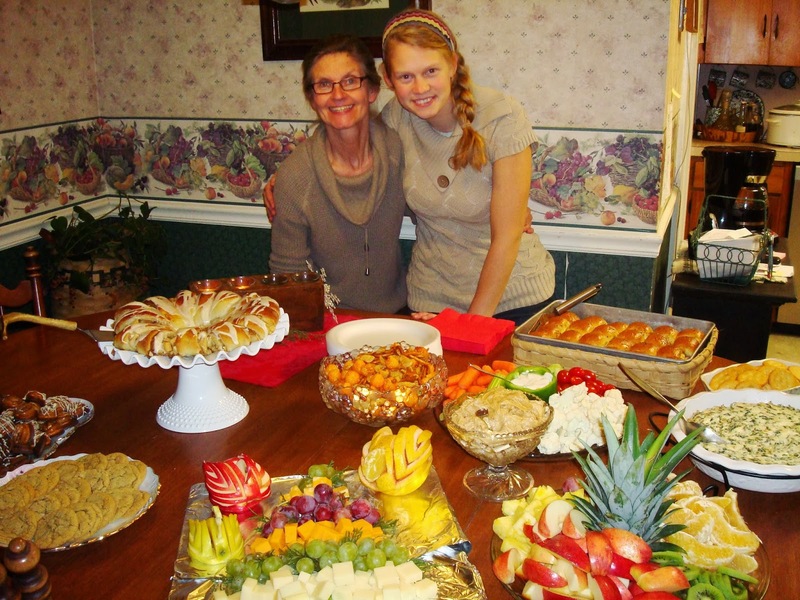 Autumn and I had a party for the Patchwork Plus ladies. I thought she did a pretty good job and she said it was pretty easy. Mother came to our house this week and worked on her "Grandmothers Flower Garden" quilt while the girls and I worked in the kitchen making treats. We pulled the rocking chair out in the kitchen so she would be comfortable. Your life has been full and very interesting. I love how you included Mother for the day. Isn't she doing a great job with those hexies? Say hello to your dear mother for me, and tell her that she is making more progress on her hexies than I am these days! Looking forward to seeing the finished quilt that you are working on in those first pictures! OH I loved the stars quilt! Lovely! 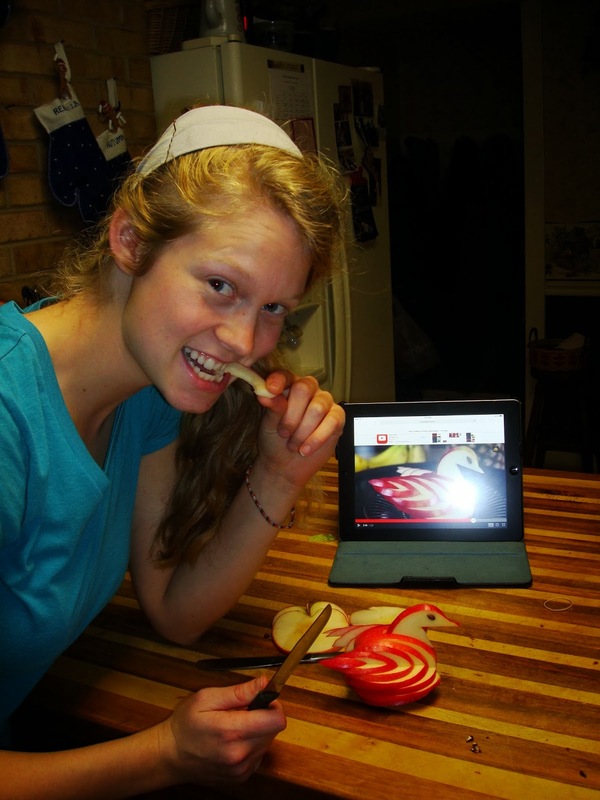 and the Apple very talented people! Hi Barbara! I haven't seen the floor model of that beautiful quilt! I'll have to be sure and look for it - it's gorgeous. 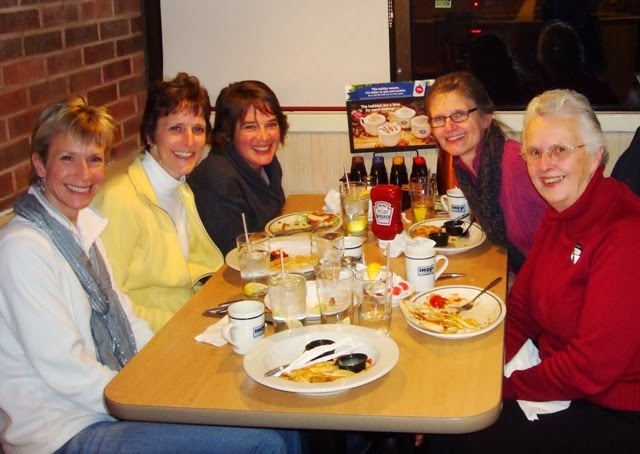 i know you must have had a wonderful time with all the Patchwork ladies!! 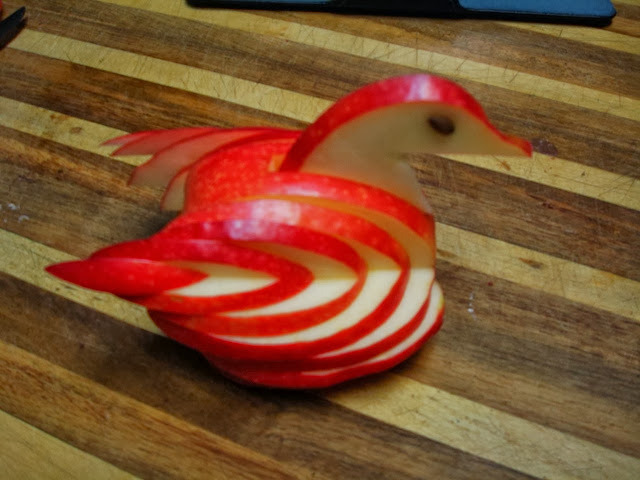 The table looks like quite a spread...super creative with that apple swan, too! Enjoyed your update. Great post, Barbara! Loved seeing the quilts you are working on. This is such an interesting post and your blog is wonderful. I am a quilter new-bee and learning as I go, but having so much fun. I've just completed my first new quilts. Small cozy up quilts for my two granddaughters. Oh, and their mother's name (our daughter) is Autumn, middle name Rose. 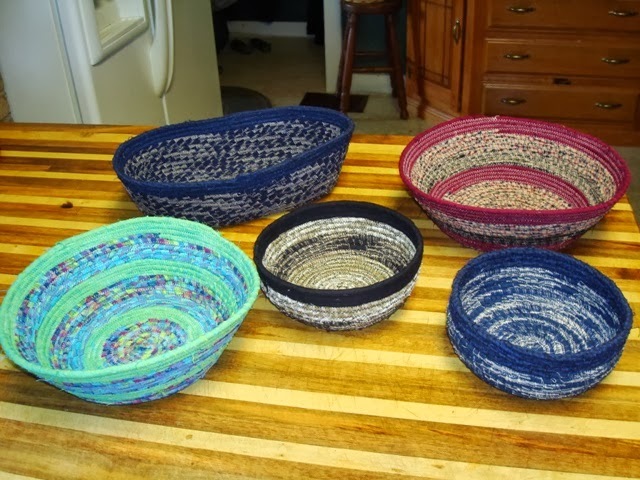 I went to the Clothesline fabric bowl tutorial. I have a question: Do you have trouble with needles breaking, it looks like it is so thick? I'm always fearful of needles breaking when I sew. 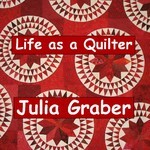 I am your newest follower and I would be honored to have you visit and check out my quilts. The first one I quilted on my sewing machine and the second one I quilted by hand, after making a quilting frame from my husband's saw-horses. If you have any suggestions or advice, I am open and willing to learn. I am so delighted to have found your lovely blog. P.S. tell your daughter that I think she did a marvelous job on her swans . . . that is so creative. Those triangle stars are really fab! 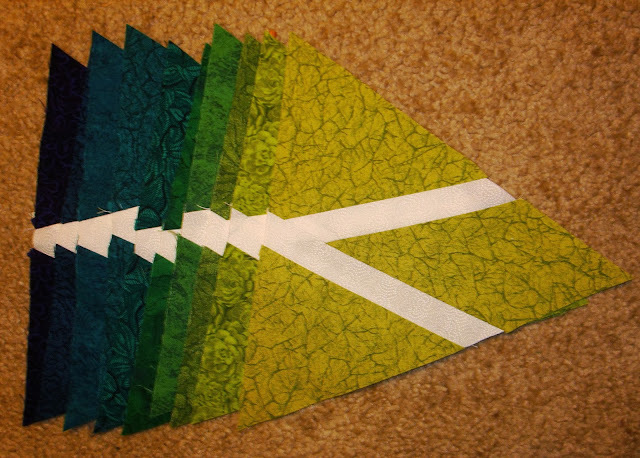 Your triangle quilt is really neat. Can't wait to see it done! 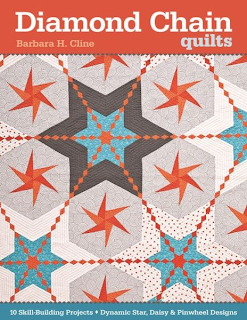 Love that star quilt, may I ask what pattern that is? 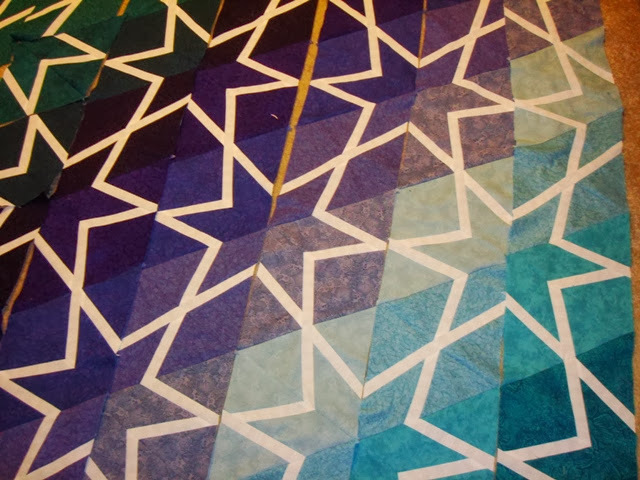 Gorgeous star quilt! Works beautifully! 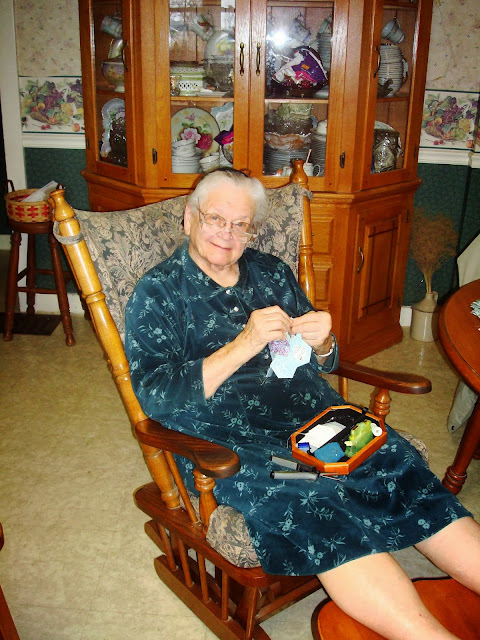 Wonderful post Barbara, your new quilt looks beautiful and how enjoyable to read about your family! Thanks for sharing. Your quilts, family togetherness and a joy in all life has to offer makes me smile. So much going on. The thing that caught my eye is when the family is sitting around the table. You can see 3 different quilts hanging on the wall. All are absolutely exquisite! 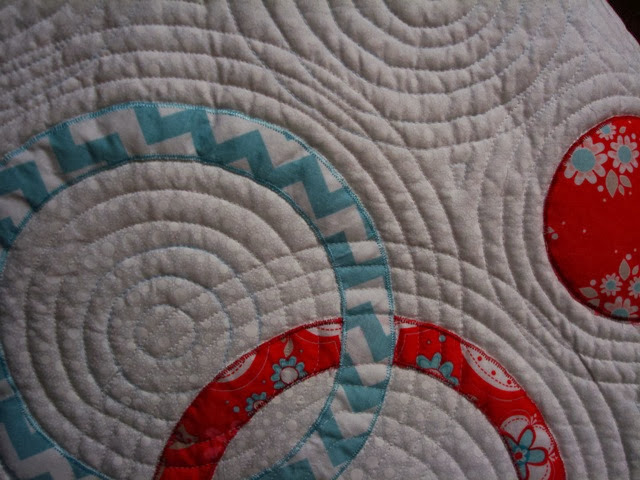 You make amazing quilts!